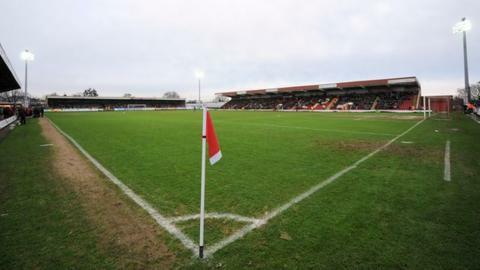 Kidderminster Harriers are waiting to find out whether seven players offered contracts will accept new terms at the Conference Premier club. Defender Chey Dunkley and midfielders Jack Byrne and Callum Gittings have all signed new new one-year deals. But manager Gary Whild is waiting on Lee Vaughan, Mickey Demetriou, Marvin Johnson, Jamie Grimes, Aman Verma, Amari Morgan-Smith and Nathan Vaughan. Danny Lewis, Kyle Storer, Chey Dunkley, Jack Byrne, Michael Gash, Anthony Malbon, Nathan Blissett, Callum Gittings, Tyrone Williams, Josh O'Keefe, Freddie Ladapo, Josh Gowling. One-year options have been exercised on Tyrone Williams and Nathan Blissett. But three players, striker Ryan Rowe and January signings Santiago Aloi and Adrian Cieslewicz, both of whom were brought in by Whild's predecessor Andy Thorn, have been let go as their short-term deals expired at the end of the season. "Making decisions on the futures of players is never easy," said Whild. "I think we have the spine and basis of a strong squad again for next season. "We have also outlined some targets in terms of new faces and hopefully this will all start to come together over the coming weeks." Birmingham City's Amari'i Bell and Lincoln's Nick Wright have both returned to their parent clubs, while Whild is in talks with Danny Jackman, who is still to be offered a new deal. Harriers lost just once in 13 matches after Whild took charge on 5 May - to finish seventh in the Conference Premier. The 53-year-old was rewarded with a rolling 12-month deal signed in the final week of the season.